My son has a tendency to snoop at the presents under our Christmas tree so I added a bit of security this year to keep him from prying around under there. 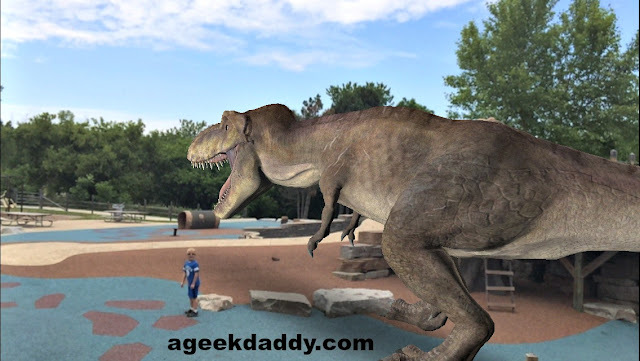 Like most boys, my son is pretty fond of dinosaurs but we found it can be a bit scary and dangerous to play with the real things so we like this Zoomer Robotic Dino from Spin Master for him to have some fun with. Joking aside Spin Master's Jurassic World collectible edition Indominus Rex was a blast for him to play with. 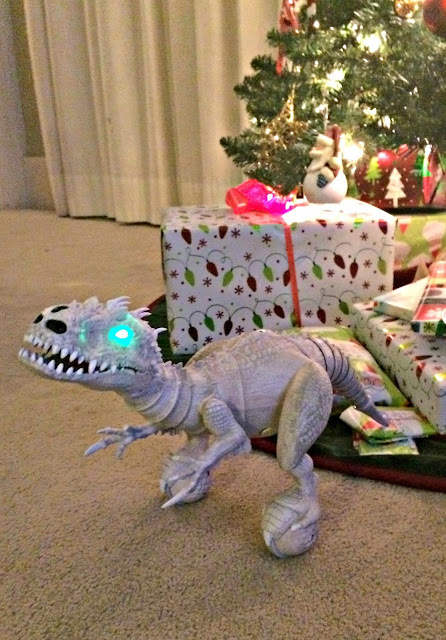 Plus it did a pretty good job of keeping him away from snooping under our Christmas tree because my son's been focused on playing with the Zoomer Dino rather than what gifts he might be getting for the holiday. 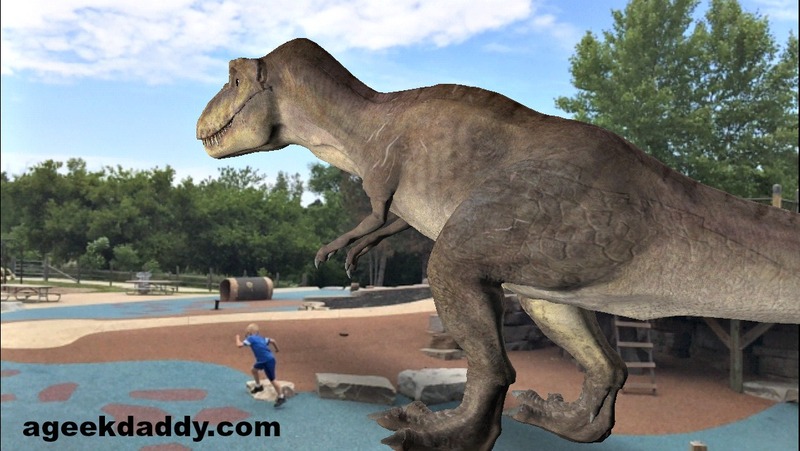 Indominus Rex lets you engage in your own Jurassic World adventures through imaginative play with this technologically advanced robotic dino. The toy uses True Balance Technology to independently hunt, patrol and explore its surroundings through its autonomous artificial intelligence modes without direction. 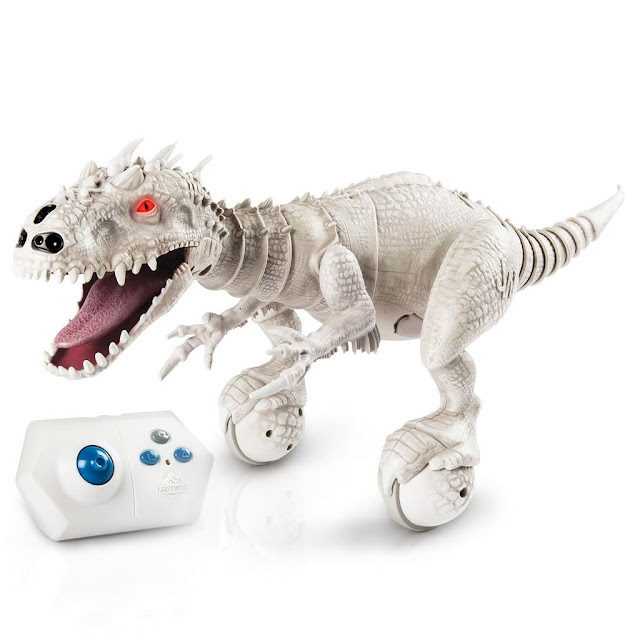 Unlike the untamable dinosaur in Jurassic World, you can control Spin Master's Indominus Rex actions through hand motions or an included remote control. Advanced IR nose sensors allow Indominus Rex to sense your hand and respond to its movements. 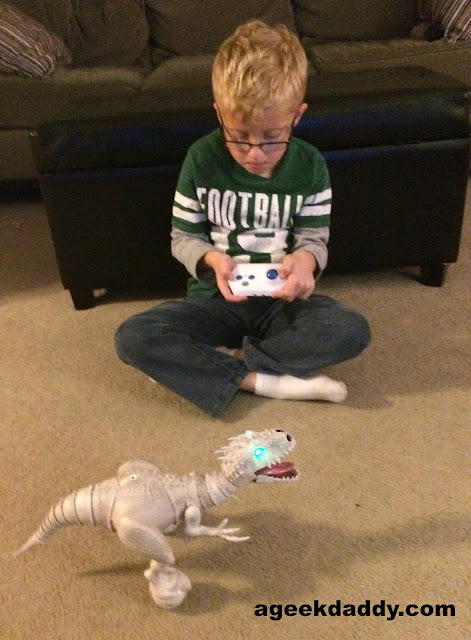 Many robotic toys lately are using people's smart phones as their steering devices, but Indominus Rex comes with its own remote control that allows its users to control the toy's modes, record combo moves, and guide its movements. I don't particularly care for handing my phone over to my six year old twins so they can play with a toy which made Indominus Rex's remote control a really attractive feature. Indominus Rex is a limited edition version of Spin Master's Zoomer toy line. It emits the real sounds used for the dinosaur in the Jurassic World movie. Plus comes with a numbered Certificate of Authenticity that makes it not just a fun toy to play with but also a nice collectible item to display. The remote control requires 3 AAA batteries, but the toy itself can be plugged into a computer with the included USB cord to power its internal battery pack. I hate always having to change batteries in my kids toys so I appreciate that Spin Master designed the toy so you can just plug it in to charge it up. If you have wall adapter for USB cords you can plug it straight into an electrical outlet for even faster and more convenient charging. Indominus Rex is available at most major toy retailers or you can purchase it online from Spin Master by clicking here. 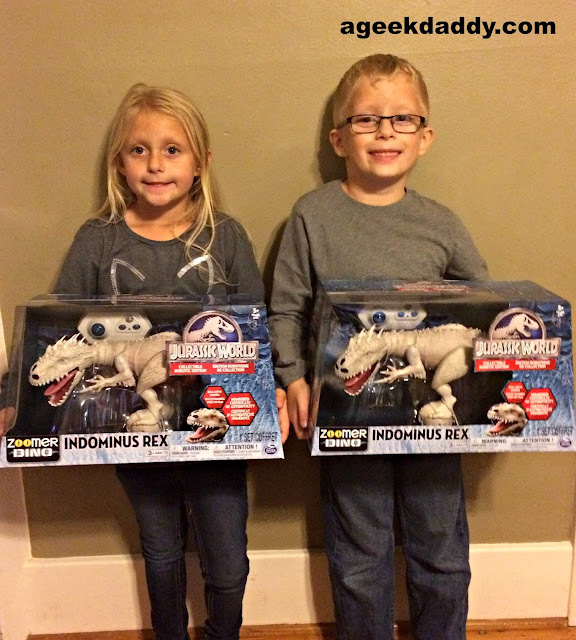 The Zoomer Dino Indominus Rex Collectible Robotic Edition is recommend for ages 5+. Spin Master toys generously provided a Zoomer Dino Indominus Rex Collectible Robotic Edition for my children to play with and one for A Geek Daddy to giveaway. For your chance to win the movie complete one or both of the following entries by Friday, January 1, 2016 before 11:59 pm EST. Must be a US resident over 18 years old to win. Follow @Geekdad248 on Twitter. E-mail thegeekdaddy [at] yahoo [dot] com your name, mailing address, and twitter handle. Must be following our account on Twitter at the time winner is selected to be eligible to win. Email subject line should be Spin Master. UPDATE: Congrats to Jim from Wixom, MI who won the Spin Master Jurassic World Dino giveaway! Visit our Facebook page , LIKE the contest post, and leave a COMMENT telling us who would be playing with this toy if you win it. All valid entries will be assigned a number in the order they are received and one number will be selected to determine the winner using random.org. E-mails will only be used to contact the winner and deleted following the selection of a winner. The Zoomer Dino Indominus Rex Collectible Robotic Edition provides a roaring good time to play with! DISCLAIMER: A Geek Daddy Blog will be responsible for selecting the winner of this contest and shipping the prize. By participating in this contest you waive any liability towards A Geek Daddy Blog or its publisher that may arise from your involvement with this promotion. A Geek Daddy Blog did not receive any financial compensation but did receive a complimentary product to review for the blog and the prize that is being awarded to one of our readers for this contest. 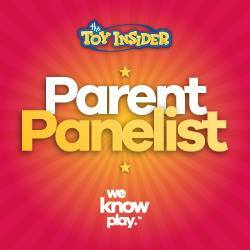 A Geek Daddy Blog is hosting this contest as a benefit to our readers. Any opinions in this post are my own. Great idea to keep them out from under the tree! I take it they were big fans of the movie? I love the video!! How cute! The dinosaur is way cool! I love your security system. Looks like fun! That dinosaur is really cool. I need to look at getting that for my daycare. I know the boys will love it. So cute! Awesome dinosaur. My son would love this. My kids would love this! 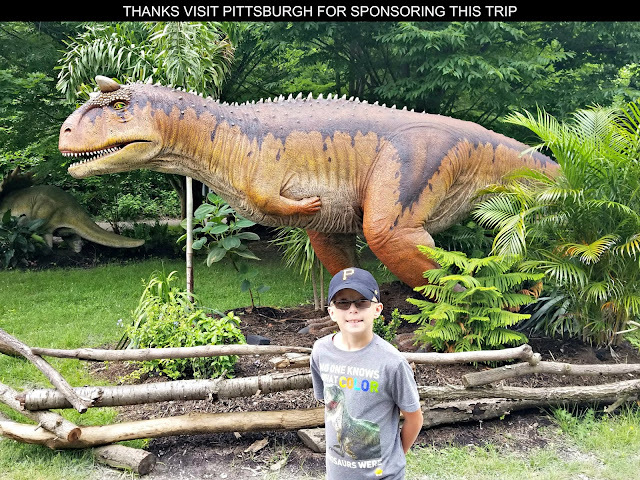 I know so many kids who love dinosaurs. I think this is awesome! Haha, he makes a great guard dog! What a fun toy especially with the popularity of the movie.